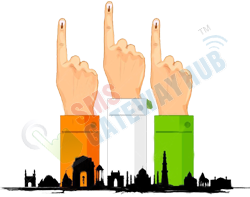 SMSGATEWAYHUB made huge arrangements for political parties to interact with huge audience and party volunteers/members in fraction of time. Candidates can simply send personalized SMS in Indian languages to voters/public seeking their vote and support. 1500 Dedicated TPS to effectively handle huge volume. Free DND Filtering and Number Validations. Lets public call or missed call to a number to "Know their Candidates" and election manifesto, when a calls arrive it simply reject the call and initiate immediate call back and play the audio of election manifesto and candidate details. Include a Simple IVR in the Voice Blast or include Missed Call number in the SMS and collects the statics and tabulate the trend how many voters are expressed their interest. Campaign For Me is a multi compatible smart phone application once downloaded party volunteers/public can promote their favourite party or candidates by sending Free SMS & Voice Calls to their phone contacts.